"Fill Our Hearts With Thankfulness"
The neighbors who live in this little cove are thankful for so many things. They join together each year at their church to prepare Thanksgiving dinner for those who have no place to go. Large tables laden with turkey, mashed potatoes, and all the fixin's greet those who come through the doors. Pumpkin pies and various other desserts are served as the guests finish up their meal. Needs are met and new friendships are formed. 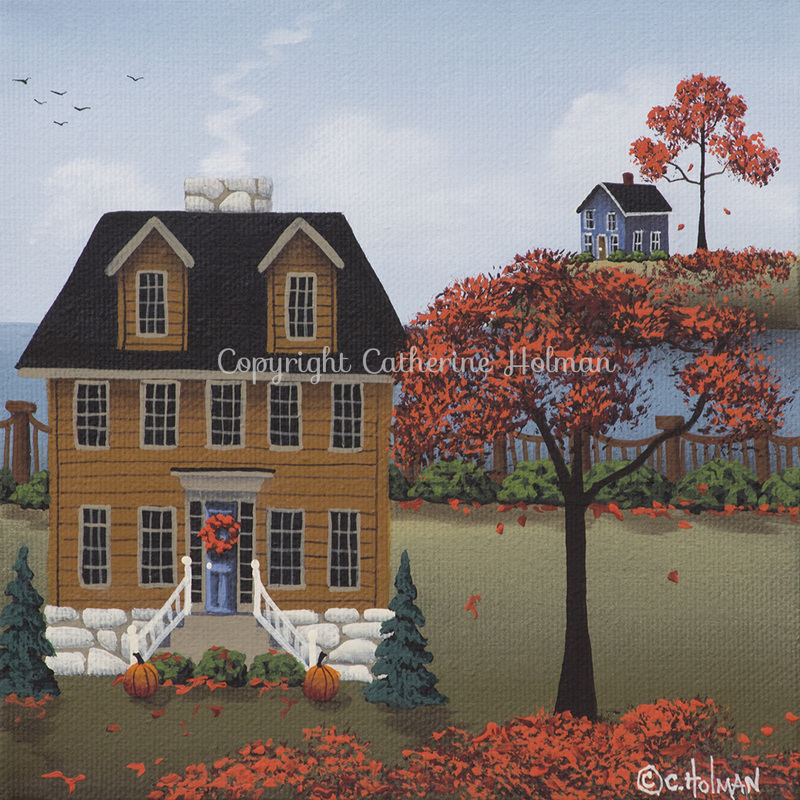 Last night I stayed up and finished this little 6" x 6" autumn painting because the Royals had the night off. Looks like we'll be playing the Astros tomorrow night. I can't paint and watch the games so I'm glad I was able to finish this one up. Are any of my readers baseball fans or am I alone on this? Oh, maybe I should do a painting with some children playing baseball! I thank my God always on your behalf, for the grace of God which is given you by Jesus Christ. I'm a fairweather baseball fan. When my team is in the playoffs, I'm happy to watch; otherwise, not so much. Sadly, they're out of the playoffs. My son is a Mets fan and they're still in the playoffs, but had a rough night last night I hear. My oldest grand's team The Cardinals are still in the playoffs. My youngest grand's team is mine (red sox) so we commiserated. Love this sweet little painting and it certainly looks as if it is home to some salt of the earth people.